Stitches: chain (ch), slip stitch (sl st), single crochet (sc), double crochet (dc), front post double crochet (fpdc). Completed size: 8.25 X 9.75 inches. Rows 14-16- Same as Rows 6-8. Rows 17-21- Same as Rows 9-13. Rows 22-24- Same as Rows 6-8. Rows 25-28- Same as Rows 9-12. Front Post Double Crochet Stitch: yo (yarn over) your hook; starting from the front, place hook from front to back to front around the post of st (stitch) in row below; complete as a dc (double crochet). Materials needed: Red Heart worsted weight yarn, (two balls) approx 6 oz , I hook, #10 knitting needles, tapestry needle, tiny beads. Stitches: chain, single crochet, slip stitch. Crochet—Attach yarn(still 2 strands) at either side seam with I hook. Single crochet around keeping work flat and even. I ended up with 31 sc on the front and the same on the back. Complete four rows of sc—joining with a slip stitch at the end of each row. Row 5-Sc 8 sts, chain 30, sc in st 23 and the following 7 stitches, repeat the same on the back side of the purse. Crocheting in a spiral fashion, continue to sc for 2 more rounds, join with slip stitch at side edge. Using tapestry needle, weave in all ends. 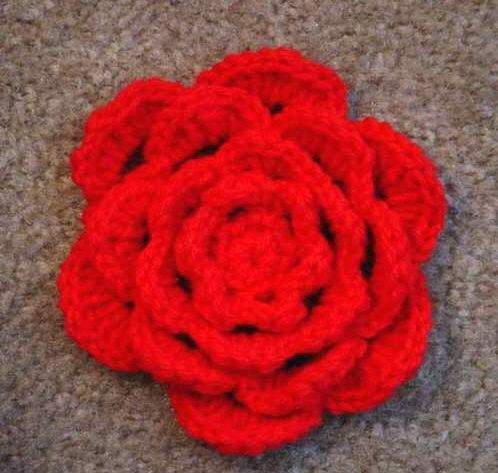 The following is my own pattern for a rose used to decorate the purse. I made the rose for this purse out of the same yarn, then used hot glue in the center of the rose to glue tiny beads in place. 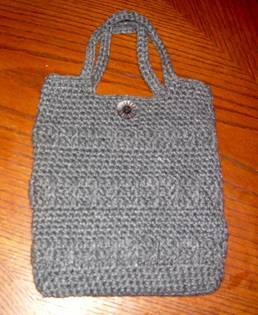 Materials needed: Worsted weight yarn approximately 1 oz., G hook; gauge: not necessary for this pattern. 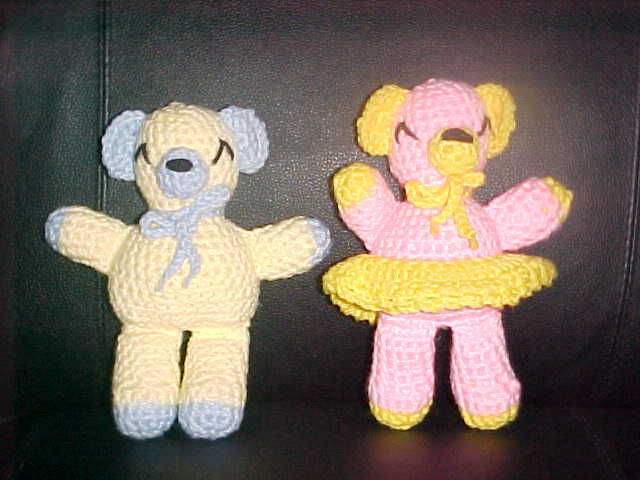 Stitches: chain, slip stitch, single crochet, half double crochet, double crochet, triple crochet. Round 1- Ch 2, 12 sc in 2nd ch from hook, sl. St to first sc. Round 2- Ch 1 and then sc in first st, ch 3, *skip one st and sc in next st, ch 3* repeat five times, sl st to first sc. Round 3- Sc, hdc, dc, hdc, sc in each ch 3 space around, sl st to first sc. Round 4- Ch 2, *sc around post of next dc, ch 4*, repeat 5 times, sl st to first sc. Round 5- Sc, hdc, 3dc, hdc, sc in each ch 4 space around, sl st to first sc. Round 6- Ch 3, *sc around post of middle dc, ch 6*, repeat 5 times, sl st to first sc. Round 8- Ch 4, *sc around post of trc, ch 7*, repeat 5 times, sl st to first sc. Round 9- Sl st, sc, hdc, 3 dc, trc, 3 dc, hdc, sc, sl st, in each ch 7 space around, sl st to first sl st. Finish off. Materials needed: Red Heart Grande yarn, other super bulky yarn, or two strands worsted weight yarn of your choice, approx 6 oz for large and small purses, ¾ inch to 1 inch button- to fit into ch 2 space, I hook. Round 1- Ch 21(can be 23 or 25 if you want a wider purse), sc in 2nd ch from hook across (20 sc). At end of chain and sc into unused loops of chain (total 40 sc). Round 2, etc- Sc around in spiral fashion (do not join at end of each round), for 5 ½ inches. Row 11 of flap-ch 1, sc next 3 sts, ch 2, skip next 2 sts, sc next 3 sts (8). Row 12- 13 of flap- ch 1, sc across (8). Finish off. Attach yarn at side of flap, sc around flap, sl st to side where flap connects to purse, ch 85-110 for strap- length depends on personal preference. (Sc in 1st ch, ch 1, skip 1 ch), repeat across. Repeat for second row, finish off. 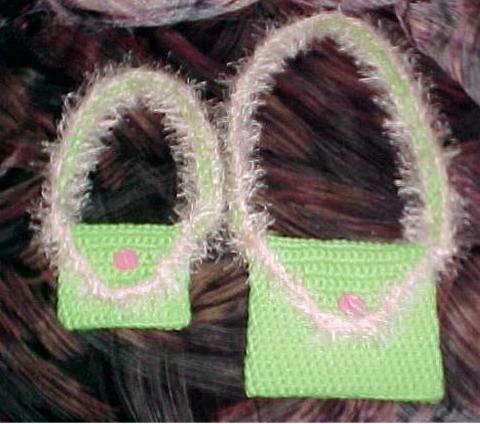 Sew with matching yarn to opposite site of purse. Sew on button on purse under ch 2 in flap. With contrasting fun fur, attach on either side of purse, sc around flap and strap twice. Finish off. 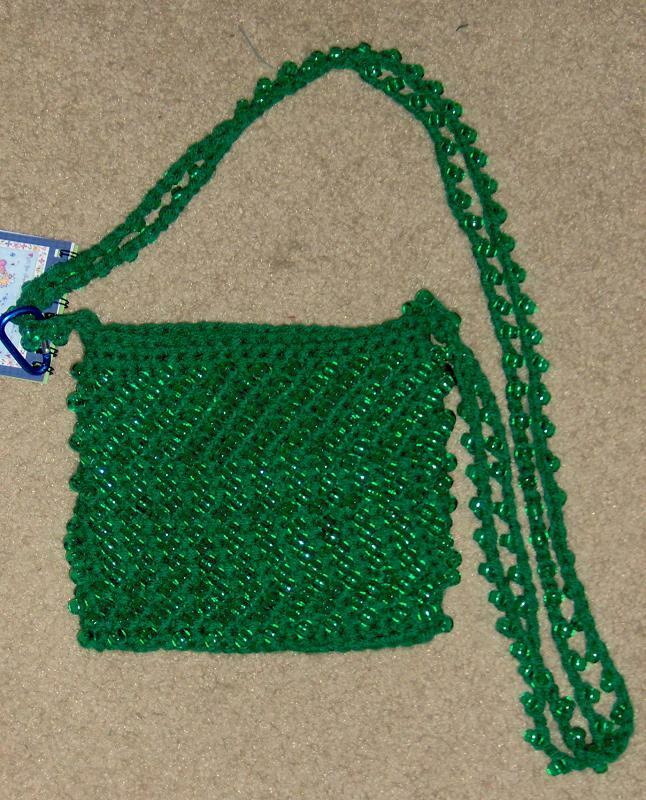 Smaller purse is made with a beginning chain of 13 sts, and completed by following the pattern but maintaining equal proportions with the larger purse. Materials needed: Lion brand Jiffy yarn, 1 ball each of 3 different colors, 3 oz/85 g per ball; 135 yd. per ball; I hook; gauge: 3 sc=1”, 3 rows sc = 1”. Stitches: chain, slip stitch, double crochet, front post double crochet, back post double crochet. Round 1- ch 4, 11 dc in 4th ch from hook. (12) Join each round with a slip stitch. You may choose to use ch 2 instead of ch 3 at the beginning of each round. Round 6-14- ch 3, (fpdc around post of 1st dc, bpdc around post of next dc around. Join with sl st at end of each round. This join forms a stitch that substitutes for the last fpdc of the round. (Color changes are made at the joining of rounds. Round 15- (ending round)- ch3, dc around. Join, finish off. Color sequence used in sample was Round 1-A, 2-A, 3-A, 4-B, 5-C, 6-A, 7-B, 8-B, 9-C, 10-A, 11-A, 12-B, 13-C, 14-A, 15-A. Colors used in sample are pale pink, lt raspberry, and white. Front Post and Back Post Crochet : Fpdc- Yarn over, insert hook from front to back and to front again around the vertical post of next st, yo and draw yarn through, yo and complete dc. Bpdc- Yarnover, insert hook from back of work, from right to left around vertical post of next st, yo and draw yarn through, yo and complete dc. Materials—leftovers from yarn already purchased for hat, I hook. Follow the same color sequence for the first eight rows of the purse (A,A, B,C,A,B,B,C). Row 2- Ch 3, fpdc around post of second dc, bpdc around post of next dc, across, dc in last dc. Rows 3-8- Repeat row 3. Rows 9-40- Sc in each st across. Use A for these rows. First 8 rows form the flap of the purse. Fold the sc section in half and sc each side to close purse. Opening between post stitches can become button holes. You decide how many buttons and attach to lower section of purse. One would be fine- three would be really fun. For shoulder strap, ch 120. Dc in each ch starting at the 4th ch from the hook. Next row ch 3, then alternate fpdc and bpdc across. Finish, leaving long strand of yarn at end. 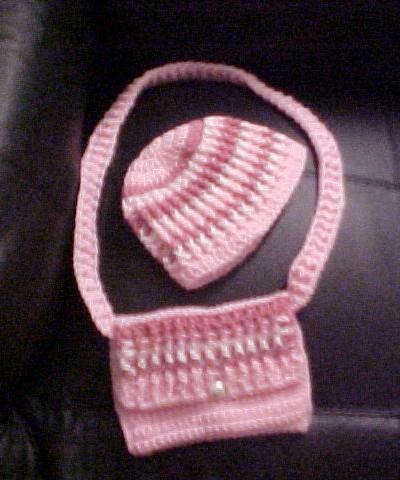 Attach strap to both side seams of purse. Named for my first granddaughter. SIZE: Megan Bear is 6 inches tall. STITCHES USED: chain, single crochet, slip stitch. Round 2: 2 sc in 1 st 2 sts. sc in next st. 2 sc in next st. sc in last st.
With white and F hook. ch2. turn. Row 3; sc in 1st 2 sts, 2 sc in next 2 sts, sc in last 2 sts (8) Finish off. 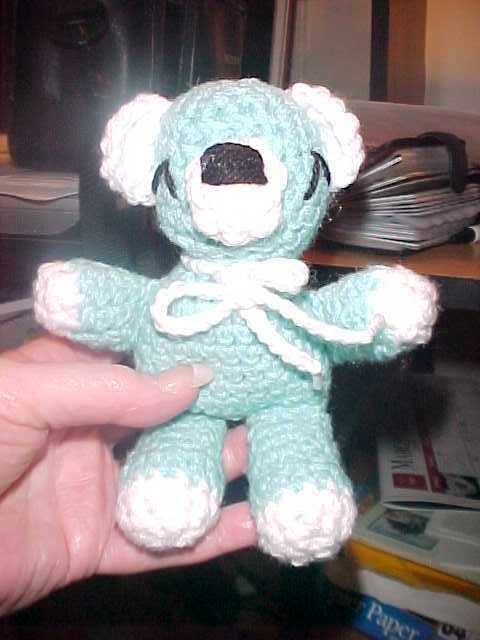 SIZE: Lindsey Bear is 8 inches tall. Round 3: sc around, bl only(9), sl st in 1st st.
With white and F hook, ch2, turn. Row 2: 2 sc in each st across(8)turn. last 2 sts (12) Finish off. row-2 dc in each st around, sl st to 1st st, finish off. SIZE: Bear is 12 inches tall. GAUGE: 4 sc= 1 inch, 4 sc rows= 1 inch. MATERIALS: Red Heart Super Saver worsted weight yarn, 3 oz main color, 1 oz white, lace ribbon(5/8 in. wide), yarn needle, G crochet hook or size needed to obtain gauge. Flatten last round, slip st across (12), finish off. Sew legs to body 1/2 in apart so that bear can sit. Round 1-2: With white, repeat rounds 1-2 of head, changing to MC in last stitch (16). Round 3: Sc around, blps only (16). Flatten last round, slip st across (8). Round 4: Sc around, sl st in 1st st, finish off. Sew to front of head. Embroider features as shown. Finish off. Sew one MC and one white piece together for each ear, matching stitches. Sew ears to top of head 1 inch apart. Sc in second ch from hook and across to end of row. Row 9- sc in first 7 sts, turn. Repeat for 23 more rows. Sew short seam with yarn needle to complete poncho. The poncho can be completed with just yarn, or use your imagination and include beads or one of the new fancy yarns to spice it up.